For other uses, see NIP (disambiguation). Nip is an ethnic slur against people of Japanese descent and origin. The word Nip is an abbreviation from Nippon (日本), the Japanese name for Japan. The earliest recorded occurrence of the slur seems to be in the Time magazine of 5 January 1942 where "three Nip pilots" was mentioned. The American, British, and Australian entry of the Pacific Ocean theatre of World War II heightened the use of racial slurs against the Japanese, such as Jap and Nip. The word Nip became a frequently-used slang word amongst the British Armed Forces. The 1942 Royal Air Force journal made numerous references to the Japanese as Nips, even making puns such as "there's a nip in the air" This phrase was later re-used for Hirohito's visit to the UK in 1971 by the satirical magazine Private Eye. 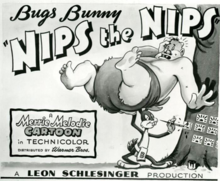 As part of American wartime propaganda, caricatures and slurs (including Nip) against the Japanese diffused into entertainment, such as exemplified by the Warner Bros.' cartoon Bugs Bunny Nips the Nips (1944). In General Kenney Reports: A Personal History of the Pacific War (1949), George Kenney made racial statements about the Japanese, remarking for example that "Nips are just vermin to be exterminated". In a manner to evoke further anti-Japanese agitation, a Seattle Star editorial titled "It's Time to do Some Thinking On Nips' Return" from December 14th, 1944 discussed the citizenship rights of Japanese-Americans and framed their return to American society as a problem. ^ "Definition of Nip in English". Oxford Dictionaries. Oxford University Press. Retrieved 29 August 2013. ^ a b Savill, Richard (4 October 2006). "Vicar says sorry for 'nip in the air' Japanese joke". The Telegraph. ^ a b c d e Hughes, Geoffrey (2006). An Encyclopedia of Swearing. New York: M.E. Sharpe. p. 261-261. ISBN 978-0-7656-1231-1. ^ "Hirohito". The New Yorker. Vol. 69 no. 11–15. New Yorker Magazine, Inc. May 1993. p. 52. ^ Casey, Steven (2001). Cautious Crusade: Franklin D. Roosevelt, American Public opinion, and the War Against Nazi Germany. Oxford: Oxford University Press. p. 67. ISBN 0-19-513960-7. ^ a b Bennett, M. Todd (2012). One World, Big Screen: Hollywood, the Allies, and World War II. University of North Carolina Press. p. 102. ISBN 978-0-8078-3574-6. ^ Meilinge, Phillip S. (2001). Airmen and Air Theory: A Review of the Sources. Maxwell Air Force Base: Air University Press. p. 38. ISBN 1-58566-101-5. ^ Speidel, Jennifer (2005). "After Internment: Seattle's Debate Over Japanese Americans' Right to Return Home". Seattle Civil Rights and Labor History Project. Civil Rights and Labor History Consortium, University of Washington.